Nestled on the Iberian Peninsula, just to the left of Spain, is one of the best European holiday destinations. Sunny Portugal has plenty to offer to the tourist looking for a sunny beach holiday in the sun-baked Algarve, a more relaxed country break inland, or an island experience in Madeira or the stunning Azores Islands. When planning your holiday break, Portugal gives a choice of totally varied destinations, all an absolute pleasure to visit. Experience history, colourful architecture, local cuisine, tasty wines and of course the famous Port wine produced in the north of the country. Porto in the north of Portugal has a natural beauty all of its own and the Douro River and the Port producing regions are truly spectacular. The Douro river is the longest in northern Portugal, winding its way past mountains and cliffs until it reaches the Atlantic near the city of Porto itself. The city, with its colourful buildings, is a fascinating place to explore - all the little shops, cafes and restaurants along the way are just waiting to tempt you. You can enjoy a tour of the city and experience a tasting at the port wine cellars. Not only does the area produce world-famous port, by the way, as you can imbibe some pretty good wines from the local vineyards too. Visit the Palacio de la Bolsa and Se Cathedral for a little history of the city, tour the Gardens of the Palace of Mateus, or head to the vineyards for a taste of grape production in Portugal. While in the area, visit the lush green Minho region, which takes its name from the river that has always marked Portugal's northern frontier. Visit the cities of Braga, Guimarães and Viana do Castelo. How about Madeira - a stunning archipelago out in the Atlantic ocean, about 350 miles west of Morocco and a popular year-round resort. Buy at AllPosters.com Just thinking of Madeira conjures up visions of those wonderful fortified Madeira wines. Ranging in style from dry wines which can be consumed as an aperitif, to sweet wines more usually consumed with dessert, what could be more enjoyable on your Portuguese island holiday? While holidaying in Madeira, a must-visit destination is Funchal, with its stunning architecture and beautifully paved squares. Funchal was named the capital of Madeira in 1425, and is chock full of fascinating historic buildings well worth visiting, from churches to museums. The local cuisine is tasty, with tuna and codfish making up the main dishes, cooked in many ways, including baked, fried, stewed with home-grown green beans and potatoes. Fresh, locally grown fruit is in abundance, too, including maracuyas, mangos and bananas. And of course, the wine, don't forget the wine! To rest your weary head while visiting the area, choose from traditional hotels and small bed & breakfasts, right through to the most charming villas and homes. Another great Portuguese island holiday destination is the Azores islands, situated in the Atlantic Ocean approximately 1,400 kilometres west of Lisbon, Portugal. There are actually 9 Azores Islands to choose from - Santa Maria, Sao Miguel, Terceira, Graciosa, Pico, Faial, Sao Jorge, Corvo and Flores. Once again, the architecture stands out in the Azores and the towns are simply beautiful. Besides visiting the towns, it is worthwhile to visit the surrounding landscapes. In Faial Island, visit the Capelinhos area where the landscape was completely changed by a volcanic eruption, with village houses and fields covered with volcanic ash. Journey to Sao Miguel Island and enjoy magnificent views over both the island and also Lagoa do Fogo, or lagoon of fire, a lake located in the bottom of an extinct volcano with white sand beaches and very clear waters. 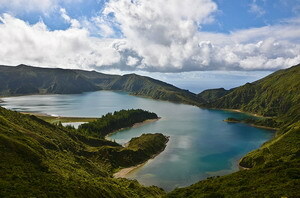 This crater lake is within the Agua de Pau stratovolcano and is the highest above sea level on São Miguel Island. The government allows no building around this lake keeping it totally unspoiled. Wherever you choose to go on your holiday, you can rest assured of a comfortable stay, whether choosing a resort vacation or a more independent Portuguese holiday. Choose to stay at the beach, in an exciting and vibrant city, or right out in the countryside. With so many varied and attractive destinations available to you, you are sure to return in the coming years for more of the magic that is Portugal.